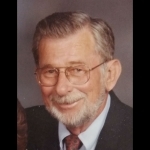 Thomas D. “Don” Troughton, Jr., 84, of Overland Park, KS passed away on Saturday, August 11, 2018 at the Kansas City Hospice House. Don was born March 29, 1934 to the late Thomas D. Troughton, Sr. and Mildred Bontrager Troughton of Kansas. Survivors include his wife, Barbara Lipp Troughton; sons, Thomas D. Troughton, III, Richard Troughton, James Troughton; daughter, Traci Troughton; five grandchildren, and a sister, Roberta Troughton Miller. Don and Barbara were so blessed to have celebrated their 44th Anniversary on August 8, 2018. A Rosary will be held on Tuesday, August 21, 2018 at 11:00 a.m. with visitation to follow until 12:00 (Noon) at Holy Spirit Catholic Church, 11300 W. 103rd Street, Overland Park, KS. A Mass of Christian Burial will be held at 12:00 (Noon) at Holy Spirit Catholic Church with entombment following services at Resurrection Cemetery, 83rdand Quivira, Lenexa, KS. In lieu of flowers the family suggests contributions to you Church, favorite charity or Local SPCA Facility at Antioch and I-35, Humane Society of Greater KC, or American Society for the Prevention of Cruelty to Animals. Don was a man of many talents. He was in the newspaper business a number of years, working for the Johnson County Herald. Also, he was part owner of a printing company, worked for Bankers Life and Casualty as well as ownerand operator of a custom dirt and landscaping company.